A close-up analysis of the 2015 Mustang development mule. 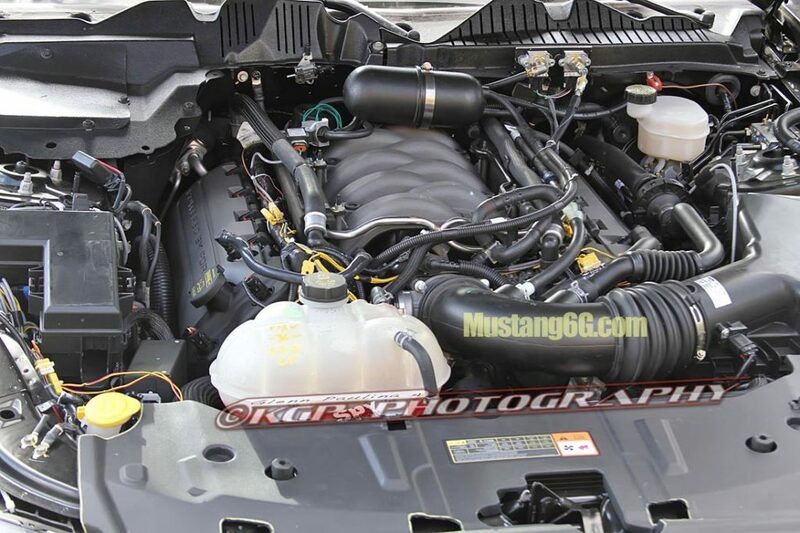 As follow-up to our previous post about the 2015 Mustang Coyote engine and its lack of direct injection (so far), we’ll take a closer look under the hood of a 2015 mule that was fortuitously discovered (or purposely left exposed?). A mule is a hacked-together engineering car, a mash of current and future production parts engineered to a specific testing purpose or set of purposes. Each of these steps come in phases, and somewhere there is a project plan for each step that would be extremely interesting to see. Dozens of mules and perhaps even hundreds of hand-built pre-production prototypes have and will be built right up to the start of production. Even production will come in phases, with pilot cars built later in 2013 in a special pilot plant located close to the engineers that will mimic the actual production line, and then in limited-output pilot production in Flat Rock (likely on the same line as current Mustangs), and finally in regular production for the first lucky customers. The position of the struts, and the inner fender liner, tells us that the 2015 Mustang is all but identical to the current car in track and width. 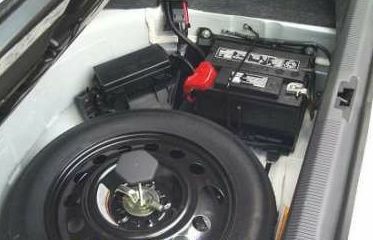 Note the cover over the battery on the left, aka Nissan 370Z. And the offset brake fluid reservoir fill on the right. 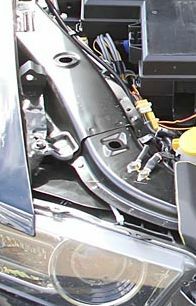 That suggests that there will be a cover on both sides in the final 2015 engine compartment, both to tidy up the appearance, and also to cover up plumbing differences in both right and left-hand drive models (when both are to be offered, and statements coming out of Australia tell us that the right hand drive model will be a late introduction). 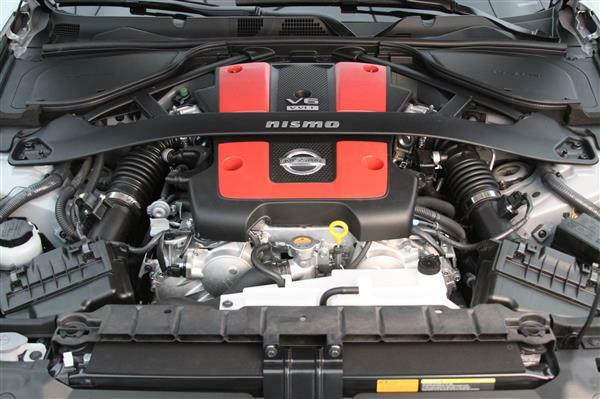 And here’s the current 370Z engine compartment, with covered compartments left and right for the battery and master cylinder/reservoir. Which switch sides worldwide as the car is built to both right- and left-hand drive. We’d also suggest, like the Z, that a brace (if offered) should be triangulated to the firewall for even greater strength. 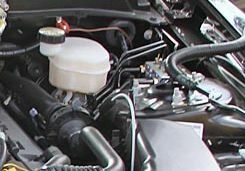 Back to the 2015 Mustang: note the anti-lock braking distribution block is now right next to the new master cylinder and reservoir – again making it easier for both right- and left-hand drive models. Then there is the giant fuse box, which per our earlier post precludes a second air intake on the left. 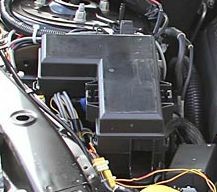 We suspect that it also now contains the engine computer, which in the current production car is left uncovered. There is lots more to look at here. Note the sound inducer – it’s been moved to a new and more central position. Then look at the strut towers: they are now three-bolt instead of 4. That’s probably a minor change, perhaps of a “gram strategy” where every ounce saved counts. It will be critical to take as much weight as possible out of the production car, and in our chart of the what we believe the specifications will be for the 2015 thru 2018 Mustangs, and we believe that the target will be as much as 200 pounds. That’s aggressive, because by and large this is still an S197 underneath, with updates for international crash standards and of course the IRS (which likely weighs little more than the solid axle, if any, and which will fortunately take an enormous amount of unsprung weight out of the suspension). Then there is the vacuum tank in plain view on top of the intake manifold. Perhaps it holds a vacuum charge for the new grill shutters? And what are those two metal (valves?) on the firewall to the right of the tank? They may simply be part of the engineering instrumentation of the engine, or something else we don’t yet recognize. There are also a number of green and yellow wires – these are part of the engineering instrumentation, so ignore them for now. Also of interest is the new air intake. It’s very similar to the existing one (although the throttle body is canted slightly upwards, not unlike the Coyote engine in the current F-150 – is it possible here that the engine is mounted a bit lower in the 2015 Mustang?). 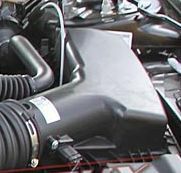 The airbox, however, is necessarily different due to space constraints and suggests that the rectangular air filter is upright instead of flat. Ford has designed very efficient intakes in recent years (it is, after all, “free” horsepower), and we’d expect the same thing here. One of the fun things in this hobby is looking at spy pictures, and especially so for a new enthusiast car. The extraordinary thing about the 2015 Mustang is that the all-new independent rear suspension has already been photographed in high-res detail, and now the engine compartment has been as well. We’ve also seen the dashboard, although at this early point it’s still a hacked-together affair using Fusion gauges, radio, and HVAC (we suspect that the main wiring harness is purposely related). We have to wonder how and why Ford has allowed so many leaks to occur… unless it was on purpose. Finding at least two cars sitting around without their handlers is too much of a coincidence. But a good “coincidence” for us because now we get a chance to see if Ford engineers will be allowed to create what they are capable of, or what budget or lack of imagination constrains them to. That unfortunately has too often been the situation and we hope it isn’t the case again with the 2015 Mustang. With a new and much smaller and lighter Camaro coming out just after the 2015 Mustang, the competition will be even tougher. And Ford has already lost the sales crown to the Camaro, despite the extreme weight and the constrictions imposed by the Camaro’s concept car interior with it’s terrible ergonomics . The new Camaro will be based on the GM’s new Alpha chassis, first seen in the ATS and soon to be seen under the next CTS. That automatically makes the Camaro lighter and better handling than the current Mustang, and with better dynamics all around. With a state of the art chassis, designed completely from scratch, and with a budget shared across at least three car lines, the advantage goes to GM. Unless Ford engineers get very very creative with the new Mustang.